It is really hard for a team to move forward when they are not on the same page. Too many of our conversations are not productive. In the best of cases we sometimes simply don't understand what others do. Our biases and experiences are different. We don't see things the same way. On our shared projects, we end up being late, re-understanding, redoing, or sometimes we just simply miss the mark. But, in the worst of cases, "team" members politely nod in agreement or silently dissent then leave the meeting without any intention of following through. In either case, the effects are the same, we execute poorly on something that wasn't understood or agreed upon. Turns out there are a couple of easy solutions. One is to make sure the team understands and agrees to the Big Picture. As John Medina writes in Brain Rules, "Vision trumps all other senses," so make this visual. 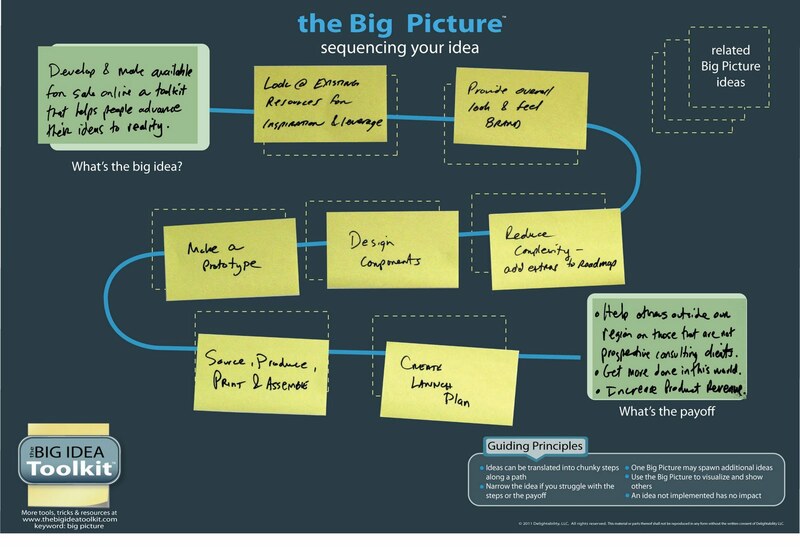 Use the Big Picture poster from the Big Idea Toolkit or something similar. I like the toolkit because it uses sticky notes and all people can participate in content creation and then rearrange the pieces as necessary. The big idea is communicated as well as the results expected, "what is the payoff." You still need to create action triggers, define deliverables and owners but that is the subject of the PlayBook and another post. Now go and there and get something done. But, please have the Big Picture so you can work smarter whether you are working by yourself or with a team.